• CCMC Evaluation Report 13698-R confirms that the interconnected channels on the underside of Radon Guard insulation provide the required means to direct soil gas to a radon gas mitigation system. • Radon Guard insulation panels installed under a concrete slab allow for the collection of radon gas within the sub-slab space to that it can then be exhausted through a radon mitigation system rather than entering the building. 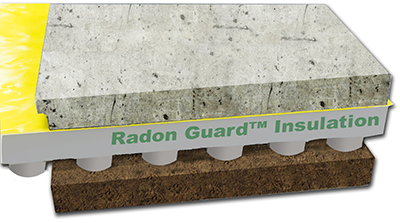 • Radon Guard insulation is the code compliant one-to-one replacement for a 100 mm thick layer of granular material, the prescriptive solution required by building codes.